World Cup...one of the best races of the year!! When you think of the World Cup race in Maryland every November, what comes to your mind? I am willing to bet if you are an American Muscle Car fan you would think that World Cup is an Import Race, and you could not be more wrong! 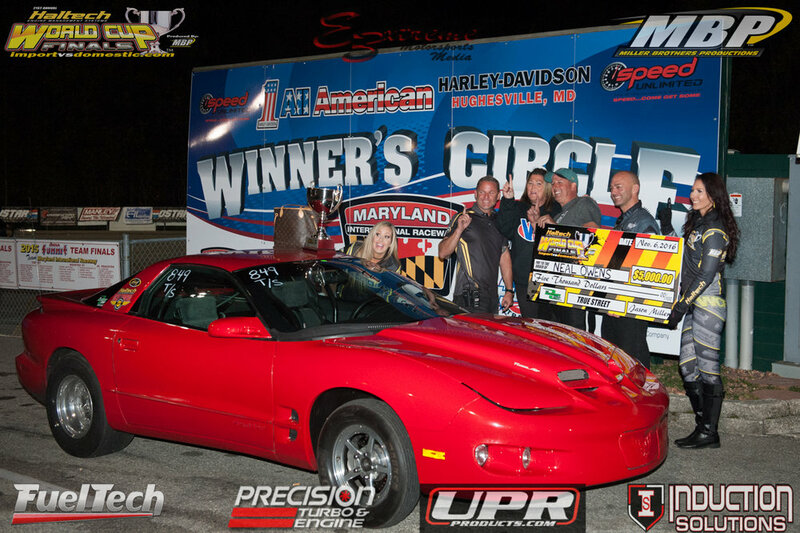 This year was the first year that E3xtreme made the trek to Mechanicsville, Maryland to cover one of the oldest door car races in the country, that being the Haltech World Cup Finals. This is a race that has been around for more than two decades now and continues to grow. Huge amount of cars, spectators, vendors, and everything else that you could ask for from a true event. I know you are saying to yourself "isn't this an import race?" and the answer would be no. The real description of this race is that it is a speed junkie's dream! I mean where else are you going to see 5 second imports and 5 second domestics in the same place. There is only one other race that has that, and that's in Florida. This is a true event and not just a drag race. World Cup is an event that has something for everyone though. Taking a look at the results you will see that your idea of this being an import event is even more wrong. Out of the 8 classes, that includes the second chance race, the tally was 7 domestic class wins and 1 import class win. Winners include some of the biggest names in all of door car racing. Names like Rob Goss, Mustang Mike, Kevin Fiscus, Eric Kenward, Carlos Sabrino, Ryan Graham, & Neal Owens, while the lone Import winner was John Staats in his awesome low 8 second Supra. Kevin Fiscus with a huge burnout to get those mickey thompson radials warmed up. With the above said, I have to also say that even in the classes where domestic muscle won, the imports gave them a hell of a run for their money. Kevin faced off against Damon Chin in the finals of Outlaw vs. Extreme and Kevin won on of all things, a holeshot 6.02 to a 5.97. You read that right, Kevin's opponent Damon ran a 5 second pass in his 2006 Toyota Celica but lost on the tree. Radial vs. Modified was where door slammer Mustang legend "Mustang" Mike Modeste in his 1991 Twin Procharger blown Mustang took the win over Steve Willingham and his 1967 Turbocharged Mustang. This was another class where the imports had a strong showing all the way until the 3rd round where three of the last six cars were imports as well. X275 vs. Hot Rod saw two heavy hitters in the domestic world face off in the finals, and saw Rob Goss and his Procharged Challenger defeat Vinny Palazzolo's '02 turbo Mustang. If you follow X275 you would know over half the class here. Bruders, Hines, Clayton, Diaz, Litz, Hecox, Stanton, etc. Both of the finalist had shown us earlier in the day that the 200 mph barrier was one that they could break over and over again. The finals though something happened to Vinny and Rob pulled away, ran a 6.86 to Vinny's 8.37. JPC Street Fighter had 40 cars attempting to make the 32 car field and it was headed up by Silvio Leal in a Nissan 240SX at 7.328. When we got to the finals though, there were two domestic muscle cars still standing. NMCA Champion Eric Kenward in his '79 Malibu Wagon going up against George Farkouh's 2010 ARH/Fark's Supercars Camaro. It was Eric that took the win. In the Real Street Sponsored Super Street class there were only two domestics in the class. This class was filled with super fast imports. If you don't think these imports were flying let me tell ya something. The bump spot for this 32 car field was a mind blowing 8.658. When we got to the finals it was #6 vs #9 qualifiers, John Staats & Shawn Ramey. John was able to take the win over Shawn. John dropped the hammer on his Supra to a 8.11 while Shawn wasn't far behind in his B18 turbo powered Civic. He was able to keep John honest by running an 8.271. Six domestic cars were qualified in the 32 car True Street field that has a 9.59 bump spot. In the end though it was Neal Owens in his all motor 2002 Pontiac Firebird that took the win when Jason Marsh's Civic had someone go wrong. Would have never thought I'd see the day an import take the number one qualifier in an All Motor class, but that's exactly what happened. Loan Prayoonto with an amazing 1995 Honda Civic took the number one spot over Mustangs driven by NMRA stars Teddy Weaver & Carlos Sabrino. Loan's Civic put up a 9.46 for the number one spot with Teddy Weaver right behind at 9.493. By the end of the eliminations on Sunday it was Teddy Weaver in his NMRA Pure Street Mustang taking on NMRA Coyote Stock racer Carlos Sabrino. Carlos ran a stellar number with a 9.526, but it was all over at the tree when Teddy went -.211 red on the tree, handing the win to Carlos. In the second chance class, it was Ryan Graham with his nitrous feed 347 '92 Mustang. The car he was suppose to run against was the '93 Civic of Victor Pena was not able to take the tree and handed Ryan the win. Ryan had an 8.90 dial and still ran it out in the final to an 8.971. Outside of the class racing we also saw a few cars trying to make personal record runs while waiting for turn around for classes towards the end of Sunday. Joe Newsham took his UPR, twin turbo Mustang and just ran a heart crushing number. He ran through the traps with a 6.11 at a stunning 255 mph. Let's not forget about Kevin's handful of 5.90's passes on radials as well. He became by far and away the quickest and fastest drag radial car in history in the quarter mile. So enough about the racing, let's talk about what else is going on all weekend. This event also featured a car show and a Sunday Bikini contest. All weekend long there was something going on. Whether it was on track racing, a bikini contest, a huge manufacture midway, or a car show. This event was one of the most organized and well run events that I have attended outside the NHRA in the last 25 years. I can tell you that E3xtreme plans on being on location from Maryland International Raceway the first weekend of November next year as well.